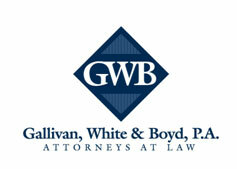 COLUMBIA, SC – The law firm of Gallivan, White & Boyd, P.A. is pleased to announce that Columbia attorneys John Hudson, Shelley Montague, and Lindsay Joyner have been selected as “Legal Elite” for 2015 by Columbia Business Monthly (CBM). CBM asked attorneys in the Midlands to nominate other attorneys who in their opinion were leading lawyers in 20 particular practice areas. John Hudson was recognized as “Legal Elite” in the area of Insurance Law. John focuses the insurance portion of his practice primarily on defending professional negligence claims, particularly claims involving physicians, dentists and other licensed medical providers. Beyond those individuals in the medical field, John also represents attorneys, engineers and land surveyors and other construction professionals in various matters. Shelley Montague was chosen as “Legal Elite” in the area of Construction Law. Construction law is a primary focus of Montague’s practice. She regularly represents professionals in the construction industry such as contractors, design professionals, and suppliers. Montague represents these clients in alleged construction defect matters including but not limited to design and construction, multi-family home defect claims, class actions, grading, and water intrusion. arise as well as litigating matters from an offensive and defensive perspective. initiated in the Midlands of South Carolina.